No need for a user to have a desktop or online user id, thus saving on user ids which will never be used. Update CRM either via the mobile app, or using SMS. 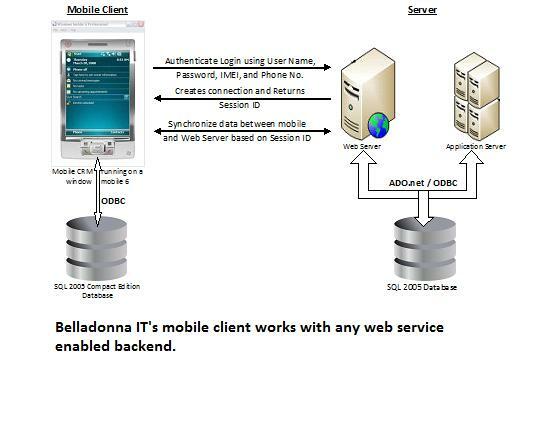 Read https://belladonnait.wordpress.com/2010/08/11/a-customer-care-solution-that-any-small-business-can-afford/ for the details of the SMS gateway case study. Application available even when the user is out of range or in low signal area. Sync happens when the signals are strong enough. Custom screens and pick lists depending on the user requirement. Synchronizes with any back end CRM, both on premises and on demand subject to web services integration being available. Can be deployed stand alone on a cloud. The product is being currently field tested in Bangalore. We are seeking beta testers for various deployment scenarios mentioned above. Contact us for more details.